Titanium Ring | What's New at Rainnea Ltd.
We were asked by Helen and Andrew to create a pair of unique Titanium rings that would capture the essence of a flower that Andrew made specially for Helen some years ago and also include Celtic Knotwork. It was a lovely commission to be part of and we created a stylised representation of Andrew’s flower which worked beautifully with the Knotwork design encircling the ring. The finish on the rings was heat-blued that we then polished off slightly more on Helen’s ring than on Andrew’s to suit their own personal tastes. We created this custom titanium wedding ring from Michael’s own sketch of the Aonach Eagach mountain ridge. To get this unique look we treated his ring with a special sandblasted and heat treated finish. We were commissioned to craft this very unusual ring for Skyler who asked that we use aerospace grade titanium but with the special request to give it an old wrought iron look and feel, with a Celtic knotwork design. This is the first time that we have made a ring quite like this and after a process of research and development to get this finish we are very happy with how it turned out. Using titanium meant that this ring is far lighter and more durable than if we had used wrought iron. “The ring Rab and Tanya designed for me was relatively a last minute decision. The idea for a wedding ring, for which I had in mind, was something I didn’t believe I could achieve. It was only by chance that I came across their website. Needless to say, I was completely taken by some of the designs that were posted. I knew straight away that I might just be in luck. It was through a jumbled collection of ideas that Rab was able to create the exact design I was looking for. Rab mentioned a number of ways in which he could go about designing the ring, which unashamedly, I opted for the way he thought best! Once my ring arrived I was completely taken and speechless at the finished product. Not only had he crafted the wedding ring in a way that both resembled its intended meanings, but in a masterfully crafted way too. I was a little nervous about him heating the ring up to create a bluish colour. However the end result, even now after four months, still has my wife and I admiring the ring. I’d just like to thank Tanya and Rab for taking the time to create something that is incredibly special to my wife and I. We designed and made these rings for Heather and Joe incorporating an abstract Celtic heart intertwining knotwork design. They’re made in Aerospace grade Titanium and have been given a high polish finish with a personal inscription engraved inside. We don’t just like the rings we think they’re wonderful! You have captured everything we wanted in the design. The presentation box was a nice touch and will be a treasured keep sake. Thank you so much for everything. Tomorrow we exchange our rings, and are both so excited. We would be honoured if you would include our comments on your blog, and you can be certain that whenever possible, we will recommend you to others. Once again thank you both for everything. 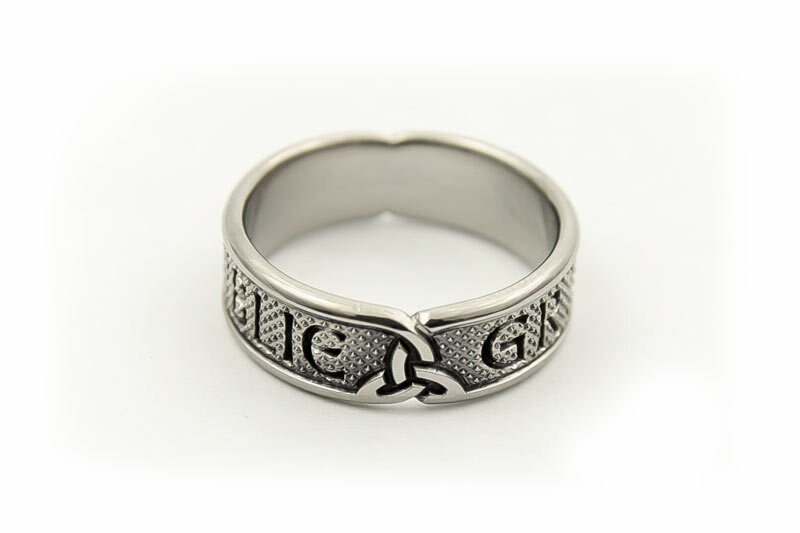 We created this special titanium wedding ring for Ben with his clan name and motto engraved into it bordered by Celtic knots. The aerospace grade titanium we use is very tough and hard wearing while being very light and comfortable to wear.